Saturday April 6th 1889 I was nearly sick this morning as Will and I are up a part of the night taking care of some little pigs. Will and I went to town before noon and stayed till after dinner at Hattie's. Mother came in the afternoon to stay all night. I helped Adda a little with the work after I came home but went to bed very early as I felt very badly. Sunday April 7th 1889 I helped do up the work and Will and I went to church. I helped Adda get the dinners over and we went to the valley and took Mollie Stevens home from Hattie's. The rest of the folks went to Mrs. Custer's funeral at the Methodist Church. It was supper time when we got home. As soon as we got the supper through I read a little took my bath and went to bed. A windy disagreeable day to be out. Monday April 8th 1889 The first thing after breakfast I went out and worked with the chickens for a while and then wrote a letter to May and fixed up her birthday present to send today. I then cut out two waists for Mother and finished them by bedtime. Lee and Mother started to Bedington in the afternoon. I was out where Will was making fence awhile. I took nails out the old boards. He was tearing down the old picket fence. Tuesday April 9th 1889 I did the work up stairs, cleaned up my room good, took the plants out and watered them and helped get the dinner. I worked all afternoon [cleaning?] out the raspberry bushes. I helped Adda get supper and wrote in the evening. Will went to town in evening. Hatt was over in afternoon said [Ott?] was sick. 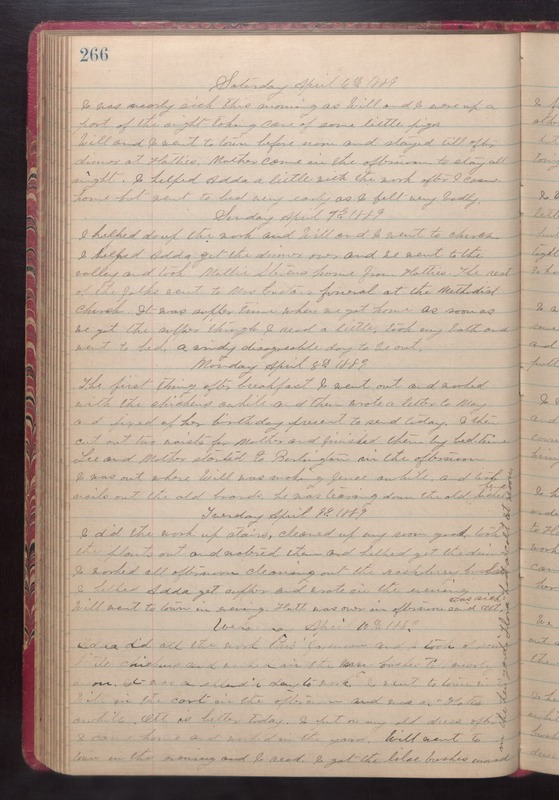 Wednesday April 10th 1889 Adda did all the work this forenoon and I took of some little chickens and washed in the berry bushes. Till nearly noon. It was a splendid day to work. I went to town with Will in the cart in the afternoon and was at Hatt's awhile. [Ott?] is better today. I put on my old dress after I came home in the evening and I read. I got the lilac bushes moved in the hen yard. "Flora" had a colt at noon.